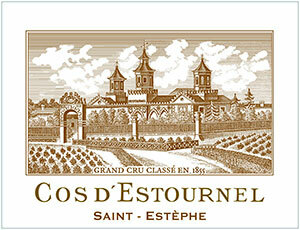 The 2002 Cos d'Estournel is a blend of 58% Cabernet Sauvignon, 38% Merlot, 3% Cabernet Franc and 1% Petit Verdot. This vintage was late ripening with wonderful weather in September and very low yields this year. Deep garnet colored with a touch of brick, the palate sports tobacco, cedar chest and yeast extract scents over a core of figs, dried mulberries, fruitcake, sautéed herbs and cinnamon toast with a waft of oolong tea. Medium-bodied, the palate features bags of freshness, with firm yet grainy tannins and plenty of mature dried berry flavors, finishing long and spicy. Tasted blind at Farr’s 2002 Bordeaux tasting. Just a fantastic wine…clean, fresh, bright and bushy tailed on the nose with blackberry, raspberry, cedar-wood and a real palpable sense of terroir. The palate is full-bodied, ripe and plush on the entry, focused and poised with good backbone, a wine intent on out-living its alumni. Corpulent and weight towards the finish. A wonderful Cos courtesy of Jean-Guillaume. Tasted October 2009.